Mass panic and hysteria swept the United States on the eve of Halloween in 1938, when an all-too-realistic radio dramatisation of The War of the Worlds sent untold thousands of people into the streets or heading for the hills. The radio show was so terrifying in its accounts of invading Martians wielding deadly heat-rays that it is remembered like no other radio programme. Most newspapers printed dispatches sent by wire services such as the Associated Press, which extrapolated widespread fear from small numbers of scattered, anecdotal accounts. Newspapers, moreover, reported no deaths or serious injuries related to The War of the Worlds broadcast: had panic and hysteria seized America that night, the mayhem surely would have caused many deaths and injuries. For newspapers, the so-called “panic broadcast” brought newspapers an exceptional opportunity to censure radio, a still-new medium that was becoming a serious competitor in providing news and advertising. The myth of mass panics seems to underlie a lot of bad policy-making. Remember the overreaction to Katrina? So it’s pretty unsurprising that the oft-told tale of mass panic during Orson Welles’ broadcast turns out to be completely false. People are more resilient than paternalists give them credit for. This proposal in the UK to tax “fatties” highlights once again how once government gets deeply involved in funding health care, the pressures to control people’s lifestyles become significant. This is the same argument we hear from supporters of sky-high cigarette taxes, smoking bans, seat-belt and helmet laws, ad nauseam. “We all pay for it.” If only we didn’t. More on the public health scam. Perhaps someone should remind Dr. Ubel that such things have been tried with a fair amount of vigor and dispatch during the twentieth century; perhaps he would like to inquire into the results? The City of Boston and Carney Hospital in Dorchester, Massachusetts are banning the sale of sugar-sweetened drinks at their facilities and events. 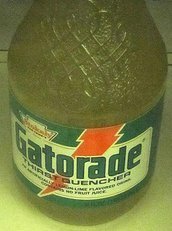 This includes the much-loved Gatorade. Mayor Thomas “Mumbles” Menino justified the ban by arguing: “I want to make this a healthier choice, the easier choice in people’s daily lives, whether it’s the schools, the work sites or other places in the community.” Hmmm….as someone on a national radio show that I stumbled onto while driving today nicely pointed out, Menino (and the Carney Hospital) isn’t exactly allowing people to make a choice in what they buy in those places since he’s banning the sale altogether. This isn’t the case of him making it easier to make that choice by offering healthy alternatives or placing those alternatives in more accessible or attractive places for consumers; he’s restricting the ability of people to make any choice of what they buy on city property. To defend Menino, people still can choose in the fullest sense — but he’s imposing some not unsubstantial costs on them (for example, it is a real pain to have to bring soda to a city dinner or local football game just to have a Coke with your rubber chicken or luke-warm hot dog). Now people being generally rational actors who will go to great lengths to satisfy their preferences, my guess is that we’ll just see a lot more folks walking down the street from their city office to the convenience store to buy what they really want or planning ahead and bringing soda onto the premises (which will probably inspire the good mayor – riffing off of some of Mayor Bloomberg’s actions a few hours south – to think about banning the consumption of such evil products on city property). Or people will buy things they don’t actually prefer – so that will shrink total welfare. But I guess that Mayor Menino – like all public servants – just knows what is best for us, and he’s going to do everything he can do (within the limits of political acceptability) to make us comply.